Yesterday the glass doors of Crystal Houses opened, a visionary exploration into reimagining the possible uses of glass in construction. The entirely transparent façade of a high-end flagship store on Amsterdam’s upmarket shopping street, PC Hooftstraat, uses glass bricks, glass windows frames and glass architraves in a way to evoke the vernacular of the area with the goal to maintain the character of the site. The 620 m2 of retail and 220 m2 of housing, were designed for investor Warenar. The design unites the ambition of Amsterdam to have large distinctive flagship stores without compromising the historical ensemble. The project, conceptualised by MVRDV, was developed and constructed as part of a multi-team collaboration including Gietermans & Van Dijk Architects, Delft University of Technology, Brouwer & Kok engineers, ABT consulting engineers, Poesia (brand of Vetreria Resanese) glass manufacturers from Italy and contractor Wessels Zeist. 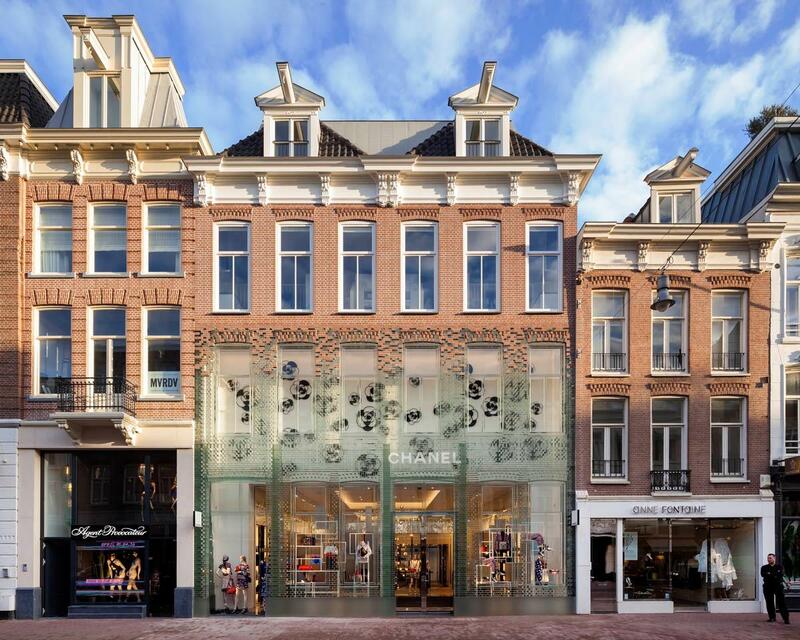 MVRDV’s Crystal Houses began its existence with the request of Warenar to design a flagship store combining both Dutch heritage and international architecture on the PC Hooftstraat, Amsterdam’s one and only luxury brand street that was previously primarily residential. MVRDV wanted to make a representation of the original buildings and found a solution through an extensive use of glass. The near full-glass façade mimics the original design, down to the layering of the bricks and the details of the window frames, but is stretched vertically to comply with updated zoning laws and to allow for an increase in interior space. Glass bricks stretch up the façade of Crystal Houses, eventually dissolving into a traditional terracotta brick façade for the apartments (as stipulated in the City’s aesthetics rules), which appears to be floating above the shop floor. Six to ten experts worked every day for a whole year in a place that bore more resemblance to a laboratory than a construction site. Due to the sensitivity of the materials, an extremely high level of accuracy and craftsmanship was required and a technical development team was onsite throughout the process. Since this construction is the first of its kind, new construction methods and tools had to be utilised: from high-tech lasers and laboratory grade UV-lamps, to slightly lower-tech Dutch full-fat milk, which, with its low transparency, proved to be an ideal liquid to function as a reflective surface for the levelling of the first layer of bricks. Despite its delicate looks, strength tests by the Delft University of Technology team proved that the glass-construction was in many ways stronger than concrete. The full-glass architrave, for instance, could withstand a force of up to 42.000 Newton; the equivalent to two full-sized SUVs. The development of new construction methods unearthed additional possibilities for future building, such as the minimisation of waste materials. In essence, all of the glass components are completely recyclable. Waste materials from the project, such as imperfect bricks, could simply be (and were) melted down and re-moulded or entirely repurposed. Such is also true for the entire façade itself, once the building has reached the end of its life span, the whole facade can be melted down and given a new life. The only exceptions to this rule are added features which ensure the security of the building, such as a concrete ram-raid defence plinth, hidden in a blend of reflective and translucent materials and built to withstand the force of a car crashing into the building. Repair-protocols were developed in the event of any damage, allowing for the replacement of individual bricks. The store is currently operated by French fashion house Chanel which will return later to their previous location on the PC Hooftstraat, also owned by Warenar. MVRDV worked in close partnership with professors and PhD researchers from the Delft University of Technology, alongside engineering firm ABT, with special mention going to Fred Veer, Rob Nijsse, Faidra Oikonomopoulou, Telesilla Bristogianni and Kees Baardolf. Poesia developed and manufactured the glass bricks, whilst Gietermans & van Dijk aided in the architectural design of the project. Also involved in the development and construction of the project were structural engineers Brouwer & Kok and contractor Wessels Zeist, of whom the brothers Van de Poppe played a vital role in the innovation of the adhesive and the glass brick laying on site. Energy conservation and renewable energy experts CCS Energy Advice aided with the development of sustainable solutions and energy production. Contributors to glass elements include Siko who supplied several types of the Delo adhesives and advised how to apply them, Cura Glass for the doors and Van Tetterode Glass Studio.